15 Love Picture Quotes That Will Make You Smile! We all love beautiful love picture quotes that can lift our spirits and make us think about someone special. Love quotes can provide powerful persecutive since many times when we are in love we are so clouded by our own feelings and emotions that many times we don’t have the language Enjoy another collection of picture quotes on Everyday Power Blog. 1.) We loved with a love that was more than love. Sometimes love is beyond words. 2.) Money is numbers and numbers never end. If it takes money to be happy, your search for happiness will never end. There will always be someone richer, so happiness and love cannot be based on that. Invest in love. 3.) Always protect your queen! And your queen can represent any partner you choose. Either ways, protect them, love them, cherish them! 5.) All that you are is all that I’ll ever need. When you have true love you don’t need much more. 6.) If she doesn’t scare the hell out of you a little, she’s not the one. Love is amazing, but that doesn’t mean it’s easy or even familiar. Love takes work and it takes courage to invest the time and work. 7.) I still fall for you everyday. Love grows stronger with time. 8.) And then my soul saw you and it kind of went “oh there you are. I’ve been looking for you.” You can read about love all you want, but when you find it – you know. 9.) Love makes your soul crawl out from its hiding place. Love will make you feel strong, free and alive! 10.) I love you every step of the way. Awwww, me too! 11.) People build up walls not to keep others out, but to see who cares enough to break them down. Break ’em down! See what’s on the other side. 12.) Love is just a word, until someone special gives it a meaning. That special person will take a theory and make it real. 14.) We go together like copy and paste. Computer Love! 15.) 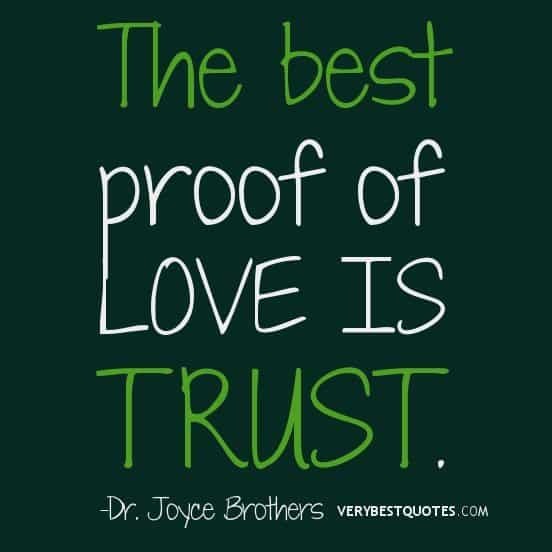 The best proof of love is trust! Yes, yes and yes! Want more beautiful love picture quotes? Send them to us and we will share them with the world?